(NaturalNews) The US Food and Drug administration (FDA) recently proposed a maximum limit for inorganic arsenic, after several rice cereals for infants and toddlers were shown to have alarming levels of the substance. Although the proposal would seem to be cause for celebration, the FDA's suggestion trails behind the European Union's food safety guidelines, and continues to allow unlimited toxic heavy metals to infest America's food supply. The FDA is proposing a limit of 100 parts per billion (ppb) for inorganic arsenic in infant rice cereal, a base level set by the European Commission (EC) for its own rice products intended for children. Inorganic is the key word. While natural heavy metals are present in the environment, industrial processes like mining and coal-fired power plants contribute to the presence of inorganic arsenic and other toxic heavy metals in the air. "Once again, the FDA is years behind European food safety guidelines, only now beginning to take action to limit children's exposure to arsenic. Yet, the same agency allows unlimited lead, cadmium and even mercury in nearly all foods sold and consumed in America," explained Mike Adams, author of the book Food Forensics, which is available now for pre-sale on Amazon here. These contaminants then fall back down to the soil where they are absorbed by food, especially various types of rice and grains. The amount of arsenic present in the rice is contingent upon where the rice is grown. In California, for instance, where there are more emission controls for factories, food tends to be clean in terms of heavy metals. In China, however, where industrial pollution is commonplace, heavy metals run rampant in the food supply. The highest levels of arsenic are often found in organic brown rice products. This is because organic crops in China are often located next to industrial plants, which contaminate the soil. While these farms are GMO-free and do not use pesticides, organic certification does not require any limits on heavy metals. Arsenic is most potent in its inorganic form. The immediate symptoms of arsenic poisoning include vomiting, stomach pain and diarrhea. Long-term exposure to arsenic is associated with various health issues, including cancer, liver disease, diabetes, nervous system complications and digestive problems. The FDA noted that arsenic exposure in infants and pregnant women can negatively impact childhood cognitive development. The key difference between the EC's proposal and that of the FDA, is that the former limit applies to rice in general, whereas the latter limit only applies to inorganic arsenic in infant rice soil. The FDA has established maximum levels in foods on a case-by-case basis, but has not established a maximum for lead, arsenic, cadmium and other heavy metals for food in general. The FDA's proposed arsenic limit was fueled by testing of rice and non-rice products. A 2016 FDA risk assessment found a link between inorganic arsenic exposure and adverse pregnancy outcomes coupled with neurological defects. Children are exposed to dangerous levels of arsenic through rice milk and infant rice cereals. 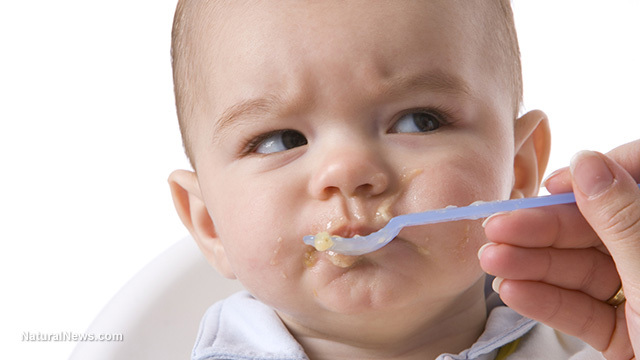 Rice cereals for infants were of particular concern in the study, because of the disproportionate amount of rice that age group consumes, according to FoodSafetyNews. Relative to body weight, rice intake is three times greater for infants than adults. In addition, national data reveals that people consume the most rice at about 8 months of age. The FDA proposed a limit of 100 parts per billion (ppb) for inorganic arsenic in infant rice cereal. Based on 76 samples of rice cereals sold in retail stores during 2014, the FDA found that almost half, or 47 percent, met the agency's proposed active level of 100 ppb inorganic arsenic, and approximately 78 percent were at or below 110 ppb inorganic arsenic. In addition to analyzing the health risks attached to arsenic, the agency developed a mathematical model for lung and bladder cancer outcomes related to the consumption of inorganic arsenic through rice and rice products. They estimate that inorganic arsenic exposure causes an additional four instances of lung and bladder cancer for every 100,000 people in the U.S. Despite the clear health problems linked to arsenic, the government is not advising consumers to alter their daily rice consumption based upon arsenic concentrations. The review was centered on infant cereals because infants are the most vulnerable to arsenic toxicity due to their small body size. In the meantime, the FDA continues to allow numerous chemical contaminants, like cadmium, lead and mercury to flood the food supply. The FDA added that "it would be prudent for parents and caregivers to feed their infants a variety of [iron] fortified infant cereals, rather than to rely solely on infant rice cereal." These encompassed barley, oats and multigrains. The public will have 90 days to comment on the proposed limit on arsenic cereal before the guidance is put into practice. Nevertheless, manufacturers are allowed to adopt the measure at any time. For tips on how to avoid heavy metals and other food contaminants, visit Top10GrocerySecrets powered by Fetch.news. The fact of the matter is that high levels of toxic heavy metals are present in whole foods, superfoods and supplements because of industrial pollution. As Natural News has explained before, toxic heavy metals make their way into the food supply through multiple sources, including dental offices, coal power, pesticides, human waste, mining practices and eroded water pipes. Companies aren't hostile about altering their products to ensure heavy metals are present in low concentrations either. Many manufacturers simply have not been informed about the problem. Even if the recent arsenic limit is put into practice, there are no consistent guidelines from federal health agencies for other heavy metals. Although the FDA has established heavy metal limits for a handful of food additives, they have consistently failed to provide up-to-date heavy metal tolerances for conventional food and dietary supplements. That is why the Natural News food forensics lab meticulously tests all of its products to guarantee they are clean and low in heavy metals. Rice protein products with the lowest levels of heavy metals include Hemp Protein from Ruth's Foods, Sproutein from Sprout Living and Living Protein by Living Fuel. Click here to see the full laboratory results at the Natural News Forensic Food Labs.